Your little darling has many great qualities: he’s humble, he’s helpful, he’s studious, and he’s (relatively) tidy. Lucky you! Unfortunately, he has one major character flaw: he can’t make up his mind to save his life. When Halloween rolls round, it’s always an endless cycle of “I wanna be this” and then, almost immediately, “No, I wanna be that!” It’s enough to make you wish there were only 30 days in October. This year, he can’t stop asking himself: does he want to be a ghost or a ninja? Why not get him this awesome costume and save yourself weeks of waffling? 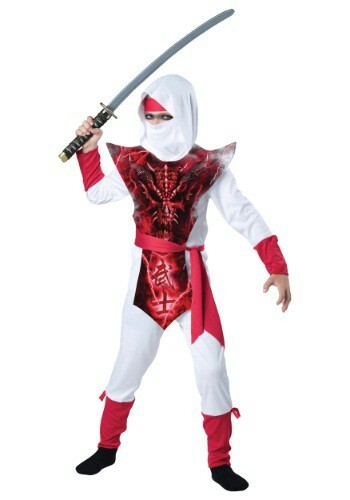 Our Boy’s Ghost Ninja Costume is idea for a child (of the afterlife, of course) who is already highly trained in the shinobi skills he needs to hide in the shadows. It gives him the terrifying look of a deadly ninja, born of pure kami! Enemies will run in fear when he's running full speed at them, or sneaking out from behind sofa while wearing this outfit and swinging his katana. (We get a little bit scared just thinking about it)! While the neighborhood will be cowering in fear from your little swordsman, you’ll be amused at his 100% unadulterated joy in this costume’s hooded tunic and fabric facemask. Add a sword and sit back and enjoy the show--and who knows, he is bound to love this look so much, he may not even need to decide on a new Halloween costume next year!